“Kisses From Katie”, a story by Katie Davis herself. Heartwarming and convicting, the story of a young woman caught between the expectations of culture, parents, friends, and the call of God on her life. 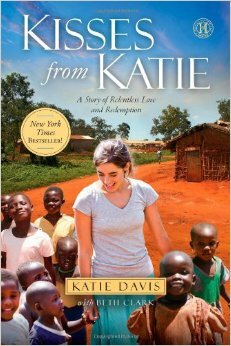 Katie Davis has a down to earth way of describing the battles of mind and heart when it comes to answering the call of God. She points out, that although her calling was to the beautiful, yet needy people of Uganda, every one of us has a different calling. It may not seem as glamorous as moving to a remote country, but it is a high calling. It’s the little things that God sees in our obedience that matter. Katie shares of her own brokenness and need of God’s strength just to live out her day to day life and fulfill her daily tasks. A good reminder that we should all be so dependent on our Savior. I was encouraged by her friendly cry to others, to follow God’s call on our lives, whether that be as a missionary, doctor, plumber, waitress, wife, mother, etc.. We each have a responsibility to answer God’s call on our lives. These golden nuggets of truth are shared amidst heartwarming stories of her life in Africa. They will make you laugh, cry, burst with joy, and yes, even sadness. Her warmth of style makes you feel as though you were sitting in her company sharing in the experiences. May we each have the humbleness, openness, willingness, and, most of all, courage to answer the call of God on our lives. A must read for everyone! It will open your eyes to what God can do. May you enjoy its depth and richness as I did.